Comedian Stewart Huff uses the word "junk" to describe the unique items he collects. However, as you hear the stories behind them, they become much more than junk. They're lost treasures, windows into people's lives and yes they're his obsessions. Join Stewart as he shares his collection of gifts from the past and present with a variety of guests each episode. This is the final episode of Season 2. In this episode, we join Stewart, Lowell and Danny Bevins as they finish the discussion they began in episode 17 regarding religion in the military. Lots of great discussion on this one, as always. As we wrap up season 2, we have plans to release a few special episodes in the coming weeks. But, we will be taking off the summer as Stewart shops for new treasures to bring on the podcast. Please share the podcast with your friends! This week, we bring you part one of a discussion about the military and the inclusion of religion. Stewart is joined by Lowell and Danny Bevins. Next week, we will bring you the follow up conversation. In the meantime, remember to subscribe and review us on iTunes! Stewart is joined by Tom Simmons and Cody "Easy Bake" Melcher. 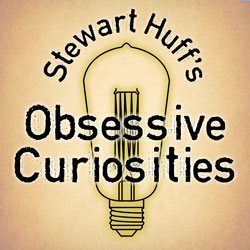 This week, Stewart discusses the Mutter Museum. He then shows the guys an item that seems to be a replica of an Alien Baby...this episode turns into a very interesting discussion about the concept of what we think Aliens look like. Enjoy! This week, we dig into the Obsessive archives to bring you a favorite episode from Season 1. Stewart welcomes his guests Matt Holt and Peter-john Byrnes to discuss a framed picture that Stewart has in his collection. This particular picture has provided Stewart with some sleepless nights and some very specific nightmares. It's a fun and captivating discussion. Remember to tell a friend about us and have them subscribe too! This week, Peter-john Byrnes and Tom Simmons join Stewart to discuss Fox's Book of Martyrs. It's a fun and fascinating conversation as always! Rate and Review us on iTunes and please tell a friend about us! In this episode, Stewart discusses daredevils with Tom Simmons and Cody Melcher. Tom and Cody gang up on Stewart for the topic of this show, but all ends well. If you're enjoying the podcast, please tell a friend and also give us a review! Stewart is joined this episode by Cody "EasyBake" Melcher and Peter-john Byrnes. Join the guys as they discuss Pope Formosus who was dug up and put on trial by Pope Stephen VI. It's an interesting look at a bizarre time! Join Stewart and his guests Tom Simmons and Peter-john Byrnes as they discuss a board game that Stewart found in a junk shop. Fans of Monopoly will enjoy this one! Remember to subscribe and review us on iTunes! This episode Stewart is joined by Tom Simmons and Danny Bevins. Stewart shows the guys his collection of drug junk. Mostly vials and bottles that had contained opium and cocaine. This leads the guys down a rabbit hole discussing drug and pharma culture. Check it out! This episode finds Stewart talking with Tom Simmons and Cody "Easy Bake" Melcher. The guys begin talking about Stewarts passion for junking and some of the characters he's met along the way. Then they settle in to talk about the Scopes Monkey Trials...and it is really interesting! So, join Stewart this week for a great time with great guests!!! Subscribe to the podcast, tell a friend and rate and review us on iTunes!